It might be hard to believe that a hard-core workout for elite military groups could be adapted for the masses, but that is exactly what former Navy SEAL Randy Hetrick did when he developed TRX training, which stands for total body resistance exercise. This suspension-based workout helps develop flexibility, power, balance and core stability all at the same time. All that’s needed is a simple strap system that hooks on to an anchor point strong enough to hold your weight. With more than 300 exercises, you can achieve a full-body workout in 30 minutes. “There is training for show—’Look at my muscles!’—and training for go,” says Percy Reynolds, regional director of fitness for Gold’s Gym International. 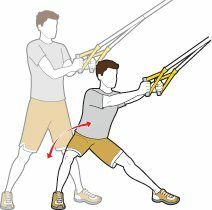 “TRX is training for go.” It is a form of functional training that improves the body’s ability to take on the stresses of life by improving performance and preventing injuries. “Your body will be more balanced and have better motor skills,” says Reynolds. The best introduction to this new workout is to take a group TRX class at a Gold’s Gym so that a licensed instructor can show you the proper form and provide a guided workout designed to help each participant progress at his or her own pace. 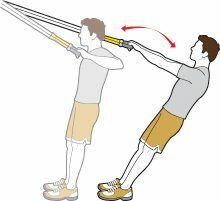 Once you have a handle on the basics, TRX can go anywhere. The straps are highly mobile and easy to set up. Take them to the gym with you, or throw them in a suitcase for a work trip. They can be attached to any secure anchor point overhead. The ideal height is about nine feet. You may secure a strap to equipment such as a pull-bar, cable crossover piece, basketball hoop support or low supporting rafters, as long as there is enough ground space beneath your anchor point. You can even secure it to a door in your apartment if you’re working out at home. New user: Quickly develops power and endurance. Post-rehab user: Allows for better control that can help stabilize the body and provide support while you begin training again. Senior user: Strengthens muscle and increases balance and coordination. Advanced user: Challenges you with unusual patterns that force the body to train in a multidimensional way. ** Note: Users must have the prerequisite strength and muscle endurance to maintain proper posture safely during the applied movements. Setup Tip: What is the anchor point? It’s the place you decide to attach your TRX strap: for instance a door, weight rack, fence or tree—any place that can hold your weight. Once you decide where your anchor point will be, you can easily lock in the two straps that you will use to exercise. Stand with your feet hip’s length apart. Face the anchor point. Grab the handles of the straps. Your elbows should be raised and parallel with your shoulders. Lean back and straighten your arms out. Then pull yourself back into a standing position using your upper back muscles. Back should be straight, shoulders down and elbows out. To increase the level of difficulty, place one foot behind the other. Rotate your heel until it’s touching the other foot. Stand facing away from the anchor point. Place one foot in the strap. You may need to hold on to a trainer or bar to maintain balance. Bend your front knee to lower your body into a lunge position and straighten the back leg as you move. Extend your arms forward; keep chin and eyes straight ahead. If you can’t do a push-up, this is a good place to start. Begin facing away from the anchor point. Place one hand on each handle. Extend both arms out to the sides. Lean forward. Keep your arms straight, or slightly bent at the elbow. 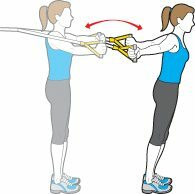 Allow the straps to pull your arms back slightly then use your chest muscles to pull your arms together slightly. Challenge yourself by taking 1-2 small steps forward before the next set, deepening the angle and increasing the resistance. A more challenging exercise, the “Alligator Crawl” is a continuous movement. The goal is to keep your back straight for 15-20 seconds without dropping. Start by placing your feet in the straps. Lie face down with your hands on the floor by your shoulders. Press into a push-up position. Walk four steps forward on your hands, then return by walking four steps back to your starting position. Core stability should be maintained: Your body should be straight and aligned. There should not be any movement or lateral sway. Do not let your lower back arch or sag during the movements. Start this advanced exercise by placing your feet shoulder’s width apart. Face the anchor point. Grab the handles, keeping your arms extended in front of you. Take one step to the right and bend that knee. Try to control your motion and the depth of the knee bend. Your body should be aligned and straight. Squeeze your inner thighs, glutes and quadriceps to push back up to a starting position. Alternate sides. 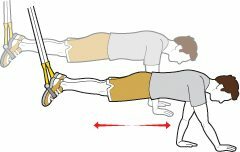 Begin face down on the floor with both feet in the straps. Your elbows should be resting on the floor or a mat. Rotate to one side. Rest on your elbow and hold that position as long as you can. Try to maintain the position for 30 seconds, lifting your body off the floor—hips and back in alignment. Use your internal and external obliques to keep your body in a linear pose. Repeat set on other side.